The Text Analytics module comes with the TAnGO (Text Analytics 'n GO) administration tool that allows you to easily manage text analytics tasks. Toolbar from which you can Register, Duplicate, Unregister, Run, or Stop text analytics runs and jobs. Panel presenting the list of currently registered text analytics runs and jobs. Job Logs panel presenting the logs of the currently selected run or job allowing you to monitor its progress. Connection status with the Coveo Job Scheduling service and link to its Settings. 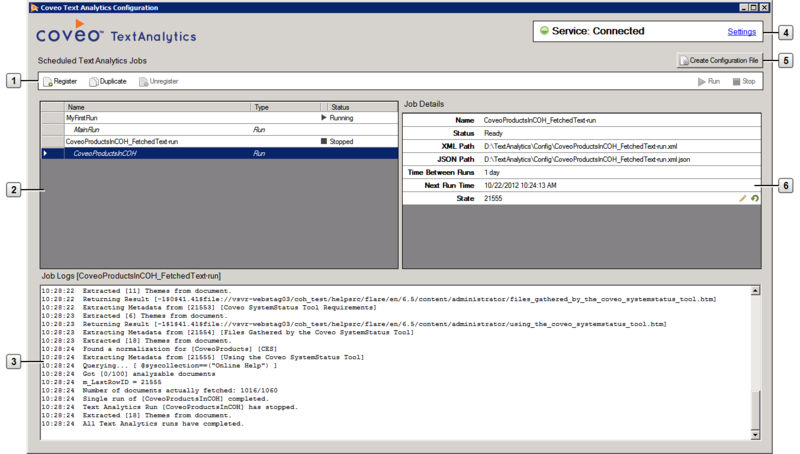 Job details panel presenting status information of the currently selected run or job, and allowing you to edit the state (see Reprocessing All Documents with a Text Analytics Run). 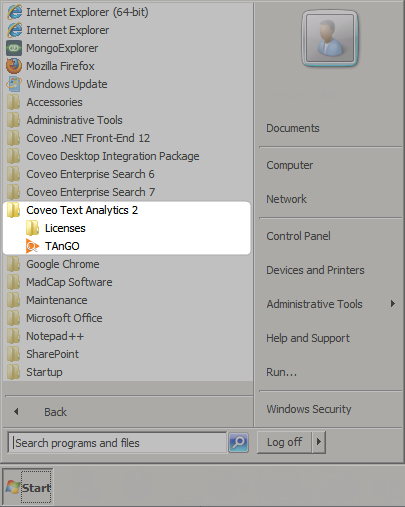 From the Windows Start menu, select All Programs > Coveo Text Analytics 2 > TAnGO. From the Windows Start menu, select All Programs > Accessories > Command Prompt. In the Command Prompt window, change to the [Text_Analytics_Path]\Bin\ folder, type TAnGO, and then press Enter.